The Austin Technology Council (ATC), supported by the National U.S.-Arab Chamber of Commerce (NUSACC), held a day-long strategy session today with 100 of the region's top technology innovators. 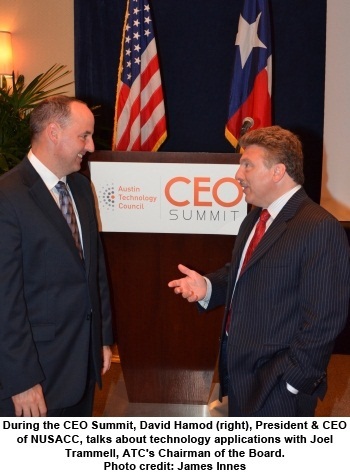 The CEO Summit took a close look at Austin's position as one of America's leading technology hubs with a view to strengthening that city's comparative and competitive advantages in innovation, entrepreneurship, and quality education. "The U.S.-Arab Chamber is proud to serve as a supporting sponsor of this important event, the first cooperative venture between ATC and NUSACC," noted David Hamod, NUSACC's President & CEO. "Austin is already involved in promoting knowledge and technology transfer between the United States and the Arab world, and there is great potential to ramp this up in the years ahead." Austin's potential was touted by the Honorable Rick Perry, Governor of Texas, who told the CEOs that Austin is the "epicenter of the new biggest deal in the world." Perry noted that Austin has been identified by CEO magazine as the "Best Place to Do Business" for the past seven years, in part because of the state-financed Texas Emerging Technology Fund, which has provided nearly $200 million to tech start-ups since its inception. 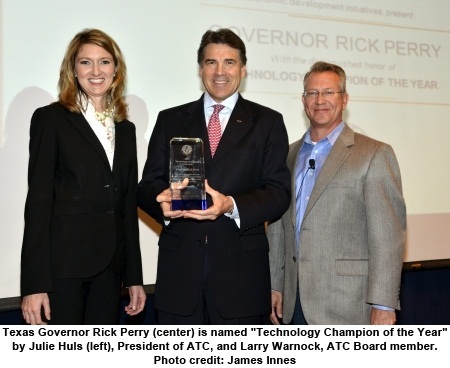 Technology is the "new frontier," the Governor stated, "and it's time for Central Texas to stake our claim." 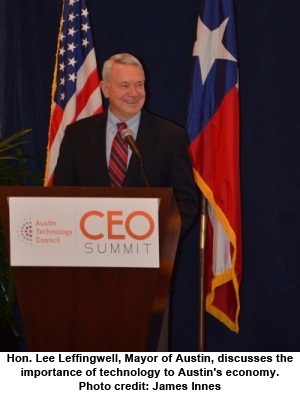 In his opening remarks, Larry Warnock, Chairman of this year's CEO Summit, sketched out three priorities for the day-long brainstorming session: achieving capital diversification, recruiting and retaining engineering and business talent, and preparing Austin's next generation workforce through STEM education (science, technology, engineering and math). The discussion about diversifying capital, described as the "holy grail" for start-ups, revolved in part around success factors that have turned California's Silicon Valley into a world-class high tech investment destination: the prevalence of role models, the entrepreneurial ecosystem, a track record of financial success, the preponderance of tech-oriented lending institutions, minimal friction to encourage deal flow, and Silicon Valley's attitude that failure is just another way of gaining experience. ​Panel participants, most of them "graduates" of Silicon Valley, highlighted some of the trends that are making it less expensive to launch start-ups, including the availability of open source and distribution channels (like Google, Facebook, and others). Reducing costs makes it easier for entrepreneurs to "bootstrap" their new businesses, the panel concluded, without approaching venture capitalists or other traditional sources of funding. The second panel, dedicated to recruitment of talent, revolved around trade-offs between searching for top talent around the world vs. recruiting locally -- including "recycled" professionals who work (or worked) for Austin-area companies. Recruitment from outside Austin provides new blood and may help to grow the talent base more quickly, a panelist suggested, especially if employers are able to "tap into a vein" and/or establish a recruitment pipeline. Sarah Smith, Director of Online Operations at Facebook, noted that her firm has hired 140 employees in the Austin area, making it the largest Facebook presence outside corporate headquarters in Silicon Valley. She suggested that rather than taking Austin's show on the road to recruit talent, Austin might be better served to invite top talent to come visit Texas to take a look for themselves. "Once you get people here," she said, "they're sold." Austin's high quality of life, and peoples' willingness to help one another, were cited over and over during the CEO Summit as important drivers for attracting expertise to Austin. While many of the day's discussants were CEOs of small and medium-sized enterprises, the discussion dedicated to STEM education was dominated by major corporations, including IBM, Microsoft, and Samsung. Samsung has about 2,000 employees in the Austin area, and the Korean company is in the process of launching a new $3.6 billion chip facility, characterized as the "largest chip manufacturing facility in the Western Hemisphere." On the topic of gaming, Lee Leffingwell, Mayor of Austin, told CEOs that Austin has particular growth opportunities in life sciences, renewable energy technologies, and interactive and creative media. Austin, he said, is "one of the largest online gaming producers in the world." The city recruits heavily from the University of Texas, the fourth largest public university in the United States, and Austin boasts America's second largest state government. Austin is the number one location in America for headquarters of Fortune 1000 companies, but the heart of Austin's business community may be found among small and medium-sized enterprises, suggested Mayor Leffingwell. He noted that 90 percent of Austin's companies have fewer than ten employees, and two-thirds of Austin's private sector jobs may be found within companies with fewer than 100 employees. More than 15,000 new jobs were created in Austin in the past year-and-a-half, he announced, at a time when many other cities were losing jobs as a result of the economic recession. Texas is the largest exporting state in America, with global sales of goods exceeding $206.6 billion in 2010, $8.8 billion of which went to Arab nations. Top export sectors from Texas to the Arab world include Transportation Equipment, Machinery, Chemicals, and Computers & Electronic Products.